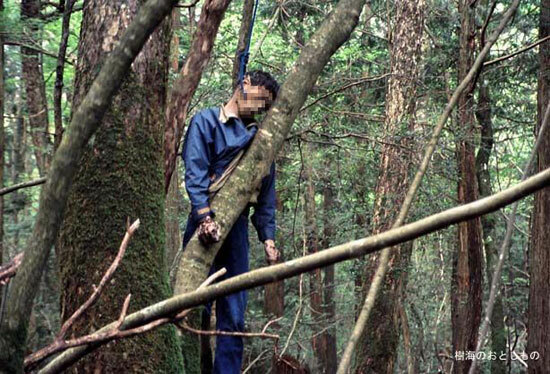 Aokigahara is the second most popular spot for suicides in the world (The first is the Golden Gate Bridge). Aokigahara Forest lies at the northwest base of Mt. Fuji, less than 100 miles west of Tokyo. Not only dense shrubbery that makes this place so creepy, but also massive dead bodies, Located at the base of Mt Fuji. It is a unique forest in many ways; there is barely any wildlife in here, thus it is very quiet, making it a popular destination among locals. However, this quietness hides a more macabre side of it as the Aokigahara is the number one suicide spot for Japanese. Since the 1950s, Japanese businessmen have wandered in, and at least 500 of them haven't wandered out, at an increasing rate of between 10 and 30 per year. Recently these numbers have increased even more, with a record 78 suicides in 2002. Due to the vastness of the forest, desperate visitors are unlikely to encounter anyone once inside the so-called "Sea of Trees," so the police have mounted signs reading "Your life is a precious gift from your parents," and "Please consult the police before you decide to die!" on trees throughout. It is hard to make a profile of the average person, who commits suicide in the forest, but they are usually males between 40 and 50 years, and the biggest month for suicides is March, possibly because March is the end of the fiscal year in Japan. So many people come from all over Japan to end their stressful lives here as they feel it's is the perfect location in which to breathe their last.